SPEEDSTER MOTORCARS REPLICA BOATTAIL "TURNKEY"
For more than 25 years Speedster Motorcars in Clearwater, FL, and the principals who preceded the formation of that company, have been building the finest reproduction 1935-'36 Auburn Boattail Speedsters in the world. They have delivered more than 100 cars and in that time have honed and developed the perfect marriage of yesterday's classic design and today's state-of-the-art technology. Carefully hand-crafted in the coach builders' tradition, the CL AUBURN SPEEDSTER REPLICA is an expression of automotive individuality combining the classic styling of one of the world's ten best looking automobiles with luxurious leathers and a mirror-smooth body. The sophisticated chassis has been continuously refined over the years. Modern improvements on the original design include the addition of power windows, radial tires and power four wheel disc brakes. The hand-laid fiberglass composite body is securely mounted to a sturdy tubular steel frame with independent front suspension and modern rack and pinion steering. It uses a new General Motors 270 hp 5.3 L V-8 engine and 4L60E four speed automatic transmission. The long 126-inch wheelbase and Wide White Wall 225/75R/15 radial tires mounted on 72 spoke Dayton wire wheels and tuned coil over shock absorbers makes for an excellent ride. Each Speedster comes with a fold down convertible top. This automobile is elegant and is guaranteed to turn heads. Several showroom display models are available at this time for immediate delivery. 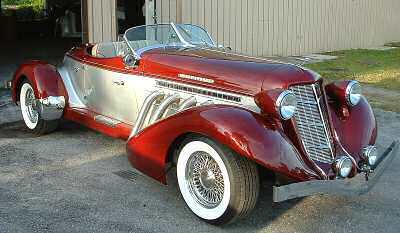 Speedster Motorcars produces replicars, and is not in any way affiliated with the original Auburn MFG Co.